Your local business may not be able to beat Amazon at the volume of their own game of convenient shipping this holiday season, but don’t assume it’s a game you can’t at least get into! This small revelation took me by surprise last month while I was shopping for a birthday gift for my brother. Like many Americans, I’m feeling growing qualms about the economic and societal impacts of putting my own perceived convenience at the top of a list of larger concerns like ensuring fair business practices, humane working conditions, and sustainable communities. There was no signage indicating such a service, but I asked anyway, and was delighted to discover that they do. Minutes later, the friendly staff was wrapping up a signed copy of the volume in nice paper and popping a card in at no extra charge. Shipping wasn’t free, but I walked away feeling a new kind of happiness in wishing my sibling a “Happy Birthday” this year. And that single transaction not only opened my eyes to the fact that I don’t have to remain habituated to gift shopping at Amazon or similar online giants for remote loved ones, but it also inspired this article. Let’s talk about this now, while your local business, large or small, still has time to make plans for the holidays. Let’s examine this opportunity together, with a small study, a checklist, and some inspiration for seasonal success. What do people buy most at the holidays and who’s shipping? According to Statista, the categories in the following chart are the most heavily shopped during the holiday season. I selected a large town in California with a population of 60,000+, and phoned every business in these categories that was ranking in the top 10 of Google’s Local Finder view. This comprised both branded chains and independently-owned businesses. I asked each business if I came in and purchased items whether they could ship them to a friend. Some employees weren’t sure. Outlets of larger store brands couldn’t ship. Some offered shipping only if you were a member of their loyalty program. Small independents consistently offered shipping. Larger brands promoted shopping online. Larger stores all stressed going online. The few smaller stores said they could ship, but made it clear that it was an unusual request. Large stores promote online shopping. One said they would ship some items but not all. Independents did not ship. USPS prohibits shipping alcohol. I surveyed grocery, gourmet, and candy stores. None of the grocery stores shipped and only two candy stores did. Only two bookstores in this town, both independent. One gladly ships. The other had never considered it. Chains require online shopping. Independents more open to shipping but some didn’t offer it. With a few exceptions, cosmetic and fitness-related stores either had no shipping service or had either limited or full online shopping. Most of the chains promote online shopping vs. shopping in their stores, which didn’t surprise me, but which strikes me as opportunity being left on the table. I was pleasantly surprised by the number of independent clothing and jewelry stores that gladly offered to ship gift purchases. I was concerned by how many employees initially didn’t know whether or not their employer offered shipping, indicating a lack of adequate training. 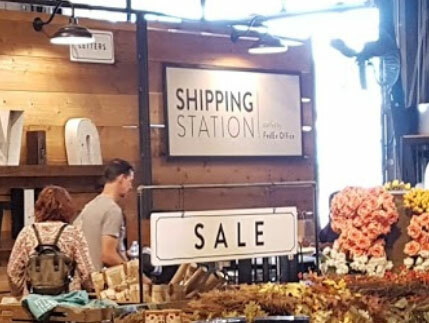 Finally, I’ll add that I’ve physically visited at least 85% of these businesses in the past few years and have never been told by any staff member about their shipping services, nor have I seen any in-store signage promoting such an offer. My overarching takeaway from the experiment is that, though all of us are now steeped in the idea that consumers love the convenience of shipping, a dominant percentage of physical businesses are still operating as though this realization hasn’t fully hit in… or that it can be safely ignored. To put it another way, if Amazon has taken some of your customers, why not take a page from their playbook and get shipping? 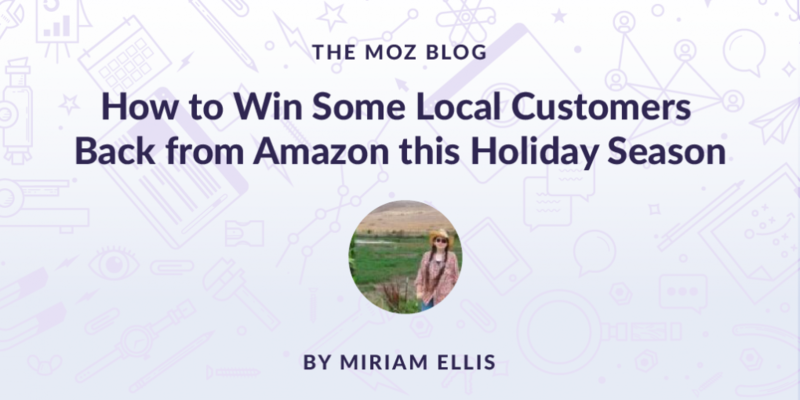 ✔ Determine whether your business category is one that lends itself to holiday gift shopping. ✔ Train core or holiday temp staff to package and ship gifts. ✔ Craft compelling messaging surrounding your shipping offer, perhaps promoting pride in the local community vs. pride in Amazon. Don’t leave it to customers to shop online on autopilot — help them realize there’s a choice. ✔ Cover your store and website with messaging highlighting this offering, at least two months in advance of the holidays. ✔ In October, run an in-store campaign in which cashiers verbally communicate your holiday shipping service to every customer. ✔ Sweeten the offer with a dedication of X% of sales to a most popular local cause/organization/institution. ✔ Promote your shipping service via your social accounts. ✔ Make an effort to earn a mention of your shipping service in local print and radio news. ✔ Set clear dates for when the last purchases can be made to reach their destinations in time for the holidays. ✔ Coordinate with the USPS, FedEx, or UPS to have them pick up packages from your location daily. ✔ Determine the finances of your shipping charges. You may need to experiment with whether free shipping would put too big of a hole in your pocket, or whether it’s necessary to compete with online giants at the holidays. ✔ Track the success of this campaign to discover ROI. Not every business is a holiday shopping destination, and online shopping may simply have become too dominant in some categories to overcome the Amazon habit. But, if you determine you’ve got an opportunity here, designate 2018 as a year to experiment with shipping with a view towards making refinements in the new year. You may discover that your customers so appreciate the lightbulb moment of being able to support local businesses when they want something mailed that shipping is a service you’ll want to instate year-round. And not just for gifts… consumers are already signaling at full strength that they like having merchandise shipped to themselves! For the past couple of years, economists have reported that Americans are spending more on restaurants than on groceries. I see a combination of a desire for experiences and convenience in that, don’t you? It has been joked that someone needs to invent food that takes pictures of itself for social sharing! What can you do to capitalize on this desire for ease and experience in your business? Cards, carols, and customs are wreathed in the “joy” part of the holidays, but how often do customers genuinely feel the enjoyment when they are shopping these days? True, a run to the store for a box of cereal may not require aesthetic satisfaction, but shouldn’t we be able to expect some pleasure in our purchasing experiences, especially when we are buying gifts that are meant to spread goodwill? When my great-grandmother got tired from shopping at the Emporium in San Francisco, one of the superabundant sales clerks would direct her to the soft surroundings of the ladies’ lounge to refresh her weary feet on an automatic massager. She could lunch at a variety of nicely appointed in-store restaurants at varied prices. Money was often tight, but she could browse happily in the “bargain basement”. There were holiday roof rides for the kiddies, and holiday window displays beckoning passersby to stop and gaze in wonder. Great-grandmother, an immigrant from Ireland, got quite a bit of enjoyment out of the few dollars in her purse. It may be that those lavish days of yore are long gone, taking the pleasure of shopping with them, and that we’re doomed to meager choosing between impersonal online shopping or impersonal offline warehouses … but I don’t think so. The old Emporium was huge, with multiple floors and hundreds of employees … but it wasn’t a “big box store”. There’s still opportunity for larger brands to differentiate themselves from their warehouse-lookalike competitors. 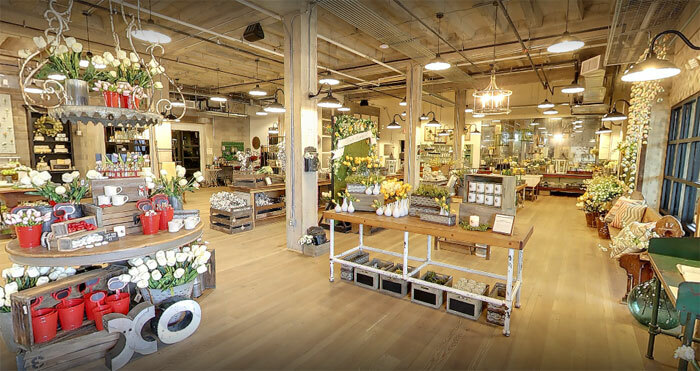 Who says retail has to look like a fast food chain or a mobile phone store? And as for small, independent businesses? I can’t open my Twitter feed nowadays without encountering a new and encouraging story about the rise of localism and local entrepreneurialism. It’s a good time to revive the ethos of the lagniappe — the Louisiana custom of giving patrons a little something extra with their purchase, something that will make it worth it to get off the computer and head into town for a fun, seasonal experience. Yesterday’s extra cookie that made up the baker’s dozen could be today’s enjoyable atmosphere, truly expert salesperson, chair to sit down in when weary, free cup of spiced cider on a wintry day… or the highly desirable service of free shipping. Chalk up the knowledge of this need as one great thing Amazon has gifted you. In 2017, our household chose to buy as many holiday presents as possible from Main Street for our nearby family and friends. We actually enjoyed the experience. In 2018, we plan to see how far our town can take us in terms of shipping gifts to loved ones we won’t have a chance to see. Will your business be ready to serve our newfound need?